The B Corp Leadership Development Pacific Northwest (BLD PNW) Conference is a one-day event organized by B Corps, for B Corps. By inspiring and connecting B Corps and their teams, we build a stronger movement to use business as a force for good. Our theme for the day is Values to Action, and our mission for the day is to connect to the values that drove us to certify as socially responsible businesses, and then challenge and train ourselves to do MORE in service of our commitment to corporate social responsibility. The day will open with Ted-style talks designed to inspire around internal and external tracks for translating values to action. Topics will include translating values to emotional intelligence at work, translating values to environmental action, to civic action, to equity and inclusion in hiring, and philanthropy. In the afternoon, we’ll move into longer-format workshops to build on ideas introduced in the morning with deeper training. Videos of our main BLD PNW 2018 speakers are now available, thanks to the support and work of Zach from local B Corp video production company One Hundred Seconds. This event has passed, and registration is closed for BLD PNW 2018. Your ticket price ($75) includes admittance to all conference sessions, light breakfast, lunch, and a hosted reception from 5-7pm that immediately follows the conference. No refunds will be provided after May 7, 2018 (tickets are transferable to colleagues). If you have any questions on whether you meet these criteria, please contact Ariana Collins at ariana.collins@fully.com. 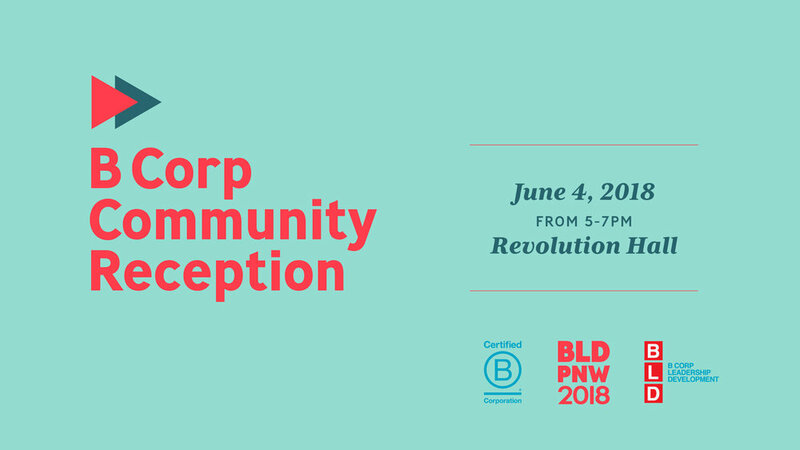 If do not meet these criteria, but would still like to join us in celebration and community building for the business as a force for good movement, please consider getting a ticket for our B Corp Community Celebration and BLD after-party on the same day, 5-7pm at Revolution Hall. This ticket gets you access to the BLD PNW closing keynote as well as the after-party reception. Join us for fun and networking with the Pacific Northwest B Corp Community. You'll be in good company, sharing the evening with employees from more than 60 different B Corps from Oregon and Washington. This reception is the culmination of the B Corp Leadership Development Pacific Northwest Conference (BLD PNW). 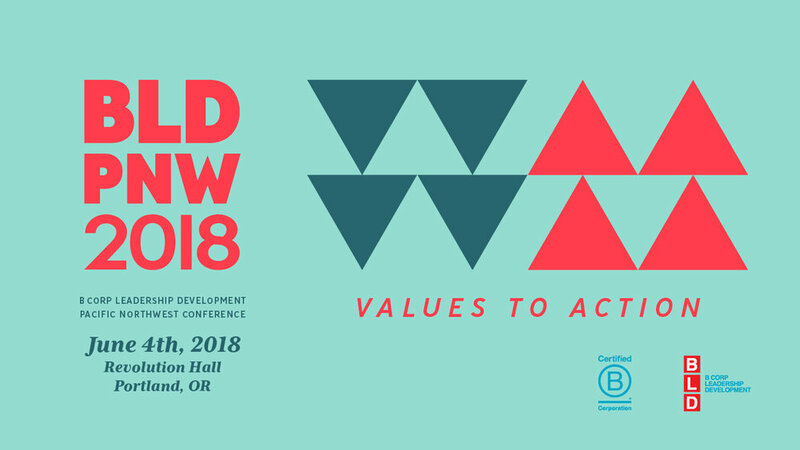 BLD PNW is a one-day conference organized by B Corps, for B Corps. While the full day conference is only open to employees of certified B Corps, we invite you to join us for this public community reception following the conference. Ticket includes a hosted bar, as well as heavy hors d'oeuvres from our reception sponsors. Thank you for joining us for BLD PNW! We want to help make your conference experience as smooth as possible - maximizing the value of the day's activities, while minimizing the stress around logistical details as well as your carbon footprint. We have partnered with B Corp TripZero to help us plan a more sustainable event, and deliver practical information to attendees about special hotel rates, travel advice, getting to the conference, and more. TripZero also will help attendees think more consciously about their logistical decisions, and offset the carbon footprint created by travel to BLD. We have a block of rooms reserved at The Duniway Hotel in downtown Portland. The cutoff date to book a hotel room at the Duniway with our special BLD PNW rate is May 14, 2018. Coming from out of town and want to coordinate with others in your area to get to the conference? We've set up an easy Google Sheet to facilitate ridesharing. Include your information!